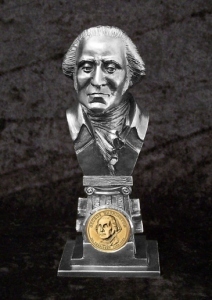 I received an e-mail from the folks at Designs by Ricker telling me about the pewter busts of the presidents that will go along with the new $1 coins being released by the US Mint. Here’s their press release. The Presidential $1 Coin Program (Public Law 109-145; 119 Stat. 2664) is an Act of Congress that directs the United States Mint to produce $1 coins with engravings of the United States Presidents on the obverse. The program will issue coins featuring each of four Presidents per year on the obverse, issuing one for three months before moving on to the next President in chronological order by term in office. Designs by Ricker will be releasing a new pewter sculpture to coincide with the release of each coin. As featured in the outstanding sculpture above, the bust of the president will be featured on a pedestal with a niche in the pedestal for the coin that will come sealed in a plastic container to preserve the brilliant uncirculated quality of each coin. Additionally, the plastic container will be easily removed for viewing the beautiful craftsmanship on both sides. The issue price of each sculpture, including the uncirculated coin in its plastic container, is $49.95. Place your order today by calling 800-373-9837, or by going to George Washington Bust with Coin, or e-mailing them at info@ricker.com.